In honor of our nation declaring its independence from England, I hereby declare my independence from sharing dessert. As a nearly lifelong dieter, I’ve spent most of my adult life skipping dessert or requesting “just an extra spoon” from the waitress, so I could steal bites from someone else’s plate. No more! It’s such a lovely, tasty relief to eat paleo food and enjoy guilt-free desserts. Happy 4th of July to my American friends – happy Wednesday to everyone else! Yum! I have never been able to find coconut chips (only flakes.) Where do you find them? I made this and it was AMAZING! My mouth is watering just thinking about it. Also had grass fed burgers on a salad of baby lettuce, shredded carrots, chopped hard boiled eggs, and red onion topped with sauteed onions, mushrooms, and shallots, and your avocado dressing, with a side of heirloom tomatoes drizzled with balsamic and avocado oil. It may have been the best dinner I ever had. And who do I have to thank? YOU!!! (and Whole30) for guiding me down this most delicious path. That sounds like a totally amazing meal. Right on! I have a question, and I’m asking you because you’ve written about wanting to be leaner…we all feel fantastic and enjoy delicious food and workout or have movement and lifting all the time. We’re getting over food phobia, binge and emotional eating, cravings and body image issues. We’re all super healthy! But does anyone actually lose weight? I’m feeling so great in my skin but I still am way bigger than I’d like. I feel really strong and sturdy which is great, but I’ve got some fat covering muscle and feel like a line backer sometimes. There are plenty of women about the size I’d like to be, but have they ever actually been fat and lost weight this way or have they just built up health and strength? Most women I have talked to who have switched to this lifestyle and are lean were lean to begin with but felt like crap and were weird about eating. Now they feel better about food and maintain their leanness. That is a valid question, and I only have half an answer for you. Yes, eating this way can be a great way to lose weight and get lean. When I first started eating this way, I lost a bunch of weight and got leaner — but that was when all my hormones were working properly. I have also seen lots of people who were very overweight or obese have tremendous success with eating paleo and losing weight. It’s also difficult to sort out what to do if you have any kind of hormonal dysfunction going on, like I do. But that doesn’t mean it doesn’t work — it means you have to experiment on yourself to see what works for YOU. The framework is very sound: eat animal protein, vegetables, some fruit, and high-quality fats. But the proportions of those things — and the overall amounts — have to be tweaked based on activity level, hormones, age, and who knows what else. The first step is conquering the emotional stuff that eating this way really helps sort out. Then, I think, you have to step back and look at calorie intake, amount and type of activity, etc. and tweak it. Not a fun answer, I know. And only somewhat scientifically sound — I’m basing this on my observations and experience. I agree that there’s nothing wrong with wanting to “lose a spare tire, or at least deflate it a little bit” — but as Mark Sisson explained when I saw him at a seminar, there’s a cost associated with getting to the next step. That cost might be less working out, more working out, less food, more food, higher fat, lower fat, more carbs, less carbs, etc. And the only way to figure it out is to experiment on yourself. Makes total sense, you are absolutely right…thanks for the response! Keep up the great work, I love your blog and message! I feel like the first big step was accepting that all calories aren’t created equal — grain calories wreak havoc, etc. But for weight loss, to some degree, calories in/calories out does matter. 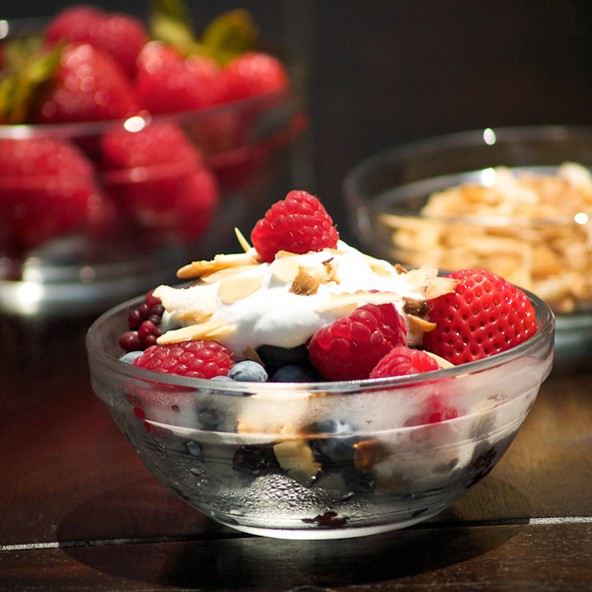 Love this dessert…I made it as a parfait, and my family completely devoured it! Amazing! Made this myself. Love guilt-free desert. P.S. open a Paleo restaurant already! I’ve never tried it in a food processor, but your question make me curious. I found these links that might be helpful… and now I definitely have to try it myself sometime soon. Eh. I tried freezing the bowl and blades and made sure the coconut milk was cold and had it in there for 10 minutes…I ended up taking it out and whipping it by hand. I think I need to use my smaller processor bowl next time so the milk doesnt climb up the sides, away from the blade? I don’t eat canned coconut milk because guar gum bothers my stomach. I make fresh coconut milk, but it is much thinner than the canned version. I am wondering if you can whip fresh coconut milk with similar results? My guess is not, but wondering if you have any idea. Thanks so much for all you do! Hmmm… I don’t know. I’ve never made homemade coconut milk. You can’t “ruin” the coconut milk by trying, so give it a shot but without adding the vanilla. If it doesn’t whip up, you can just use the coconut milk as you usually would If it DOES work, then gently stir in the vanilla by hand when it’s done whipping. I have tried to make this 2 times in the past 2 days with similar (not good) results. I followed the directions exactly, but could not get the coconut milk to whip up, even after 10 minutes at high speed. I chilled the coconut milk in the fridge overnight, I put the can plus the metal bowl and beaters in the freezer for 15 minutes before whipping. It just didn’t whip up. I do live at altitude (6500 ft.), but I doubt that is an issue since I’ve made whipped cream many times here before. Perhaps I am expecting it to be stiffer than it is suppose to be? Mine is the consistency of a thin milkshake at best. Courtney….try using just the hard fat on top of the can with a LITTLE of the water. Chill everything as usual. Whip it in the food processor for 5-10 mins and then whip by hand with a whisk. It’s a little labor intensive but it works. When youre whipping it by hand I find rolling the whisk really fast between your palms works pretty well. Or just invest in an electric hand mixer. Love coconut whipped cream. When I first tried to make it the instruction about removing some of the liquid was not part of the recipe in my book so I unknowingly took a can of chilled coconut milk (regular, not lite), stirred it up to incorporate the fat, and poured it into my pressurized whipped cream dispenser with some almond extract. Works like a dream and keeps well in there (i.e. stays fluffy) BUT, have to make sure to shake the contents down to the nozzle end before trying to dispense. No issue having the extra liquid in there. Go figure! Would coconut cream (canned) work as well? The first time I made the whipped coconut milk it worked great. Since then, i can’t find a can of coconut milk that will form solids! I leave them in the fridge at least overnight, do the freezer step, flip and open, and it’s all liquid. No thickened milk. The last 4 cans have done this (and they were different brands). A 1 in 5 hit rate just isn’t working for me. Any tips? Maybe the kind you’re buying is too good. It’s sad but true: Polar, which has guar gum, ALWAYS gets solid for me. You might try that brand. I’ve not seen that one around – i’ll hunt. I’ve tried thai kitchen, aroy and native planet, and all of them had guar gum. Thanks for the suggestion! Hmm… I have been eating this 1-2 times a week during my Whole 30. Well Fed says the whipped cream to be Whole 30 compliant, but on the Whole 9 website they say vanilla extract is a no. I hadn’t realized Melissa & Dallas outlawed vanilla extract — and at the time of publication, they gave all of the Well Fed recipes Whole30 approval except for the Peach Almond Crisp. Sorry about that miscommunication. On the up side, you do not need to restart your Whole30 — the amount of vanilla extract is so minimal, it won’t have an affect on the success of your Whole30. Until the Whole30 is over, you can make the coconut milk whipped cream without the vanilla extract, or substitute an equal amount of vanilla bean powder instead. I’ve made this coconut whip a few times now and it’s become a fast go-to. A quick pass with a spoon when I’m craving something indulgent is almost always exactly what I need. And 4 year old daughter loves it with berries! Can you make the whipped coconut cream ahead of time, and store in the fridge for 4 hours or so? Yes. It holds up pretty well for 1-2 days. Keep it really cold, and you’ll be good.